This entry was posted in Fab Friday Challenges, Field Flowers. Bookmark the permalink. Gorgeous! My Field Flowers has been neglected this winter as well…now that it’s spring I bet it will be calling my name! TFS! This is absolutely lovely, Amy! I love the softness of the flowers and the natural ribbon is the perfect finishing touch. TFS! ooh Amy , love love it !!!! you inspire me !!! beautiful together. No small accomplishment in my book. Very nice! Amy, this is so pretty, what a very charming card! Love the beautiful faceted button with the pearl against the natural ribbon! 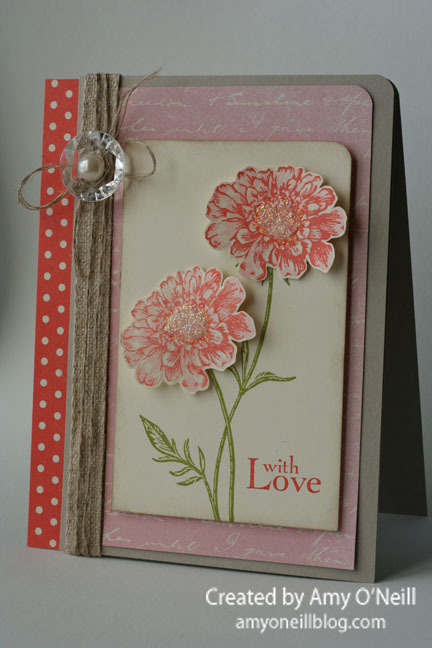 I can’t believe I have not gotten Field Flowers yet, as much as I love floral stamps! I’m sure it will be going on an order very soon now!